Nose: Peat smoke and smoked kippers on the nose, lovely mixed with vanilla, butterscotch and burnt short bread. Hints of citric fruit and burnt matches linger with subtle anise and oak in the back. Very appealing. Palate: Bold and intense on the palate with a restrained sweetness of vanilla and a touch of white peaches. Then peat smoke and coal ash arrive accomplimented by a warming spicy mix of pepper and cloves. A kick of red berry fruit is showing up, followed by dry notes of oak towards the finish. 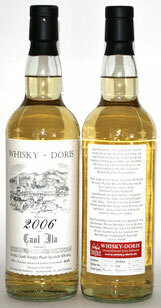 Finish: The finish is long, rich, oily and creamy with peat, smoke, tarry notes and dry oak on the tail. With water: There's significantly less peat and smoke on the nose with a few drops of water. Besides a slightly tamed vanilla sweetness there's more citric fruits coming through. Still bold on the palate with peat, smoke, vanilla and lemons. Notes of burnt caramel and tamed pepperiness towards the finish. The finish shows medium length with slightly warming notes of peat, smoke and creamy caramel. Fairly dry notes of oak on the tail. 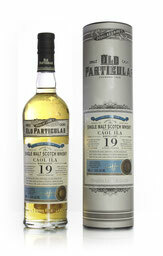 Comments: An old, very well-matured Caol Ila that cannot deny its origins. A beautiful balance of vanilla sweetness, light fruity notes and slightly burnt caramel, paired with a still strong smoky and peaty note and a tidy oak spice. In all these years of maturation, It has lost none of its power and intensity. A great dram that doesn't need any water. I like it. Nose: Fresh on the nose with lingering notes of lemons, some yellow apples and cereals. Hints of ozone, fresh mint, cold wood smoke and a touch of coal. Subtle vanilla and tender peaty notes in the back. Palate: Surprisingly intense start on the palate with a warming mix of oak spice, pepper and allspice. Citrusy with lemons, followed by a delicate sweetness of malted barley, subtle banana and green apple. Hints of sea salt and ozone towards the finish. Finish: The finish shows medium length with a delicate mix of vanilla and malted barley sweetness. This is wrapped in subtle wood smoke, complemented by fresh sea air, ozone and a whiff of spiced oak. With water: Very fresh on the nose when water is added with ozone, sea air and a whiff of salt. Behind that subtle sweet notes of malted barley and vanilla emerge, followed by some oak spice in the back. The intensity on the palate is tamed with only minor fruity notes of lemon and apples. Water brings the spiciness to the fore with prickling oak, pepper and allspice, lovely mixed with hints of malted barley and vanilla. The finish is medium long, warm and creamy with liquorice, tender toffee and a hint of coffee aroma on the tail. 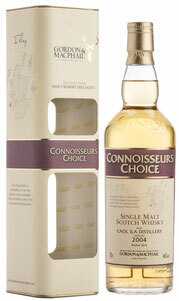 Comments: A fresh, fruity, and peppery expression of Caol Ila with an appealing nose and a tasty palate. Lovely balanced with some complexity. Very quaffable as all the classic Caol Ila aromas and flavours are there. Vibrant with a splash of water. I thank Gordon & MacPhail for the sample and the photograph! Nose: The nose starts off with smoke, phenols, subtle gauze bandage and a hint of ozone. Behind that, lovely notes of cereals and malted barley emerge, lingering with citric fruits, a touch of vanilla and plums in the back. Very appealing! Palate: Clean and fresh on the palate. Sweet vanilla, malted barley and cereals linger on the palate. This is followed by delicate smoke, a hint of peat and slightly warming spiced oak. Subtle notes of citric fruits and green apples towards the finish. Finish: The finish shows good length with creamy vanilla sweetness, complemented by barley and cereals. This is all wrapped in bonfire smoke, lively mixed with a hint of peat and citric fruits on the tail. With water: There's more smoke coming through on the nose by adding a few drops of water. Water also enhances the lovely creamy sweetness of vanilla and barley sugar. Creamy, sweet and malty on the palate, mixed with more peat smoke and oak spice. The finish is long, sweet and slightly dry with prickling oak and more bonfire peat smoke. Comments: A rather soft and gentle Islay dram. Restrained smoky and peaty, leaving enough room for the lovely barley and vanilla sweetness, nicely mixed with a filigree fruitiness. Dangerously quaffable, even in the summer time. Nose: Fresh on the nose with a significant maritime profile of smoke, bacon and tar. This is nicely mixed with a delicate fruitiness of apricots, green apples and subtle lemon. Sweet notes of vanilla linger with tender oak spice and a touch of peat in the back. Palate: Quite strong on the palate. A lovely malty sweetness, mixed with lots of vanilla is followed by slightly dry notes of oak, black pepper, anis and cloves. Impressively warming. After a while, apricots, yellow apples and bananas emerge, pleasantly wrapped in gentle peat smoke. Finish: The finish shows good length with sweet and creamy notes of barley sugar, vanilla, and apricot jam before a lovely warmth of peat, smoke and dry oak takes over. With water: Water brings in more freshness on the nose but slightly tames this lovely fruitiness and sweetness. The same on the palate where increased dry notes of oak, peat, tar, phenols and subtle smoke arrive, pushing the sweet and fruity flavours almost completely in the back. The finish is medium long, very dry and slightly warm with oak, peat smoke and a hint of barley sugar. Comments: A delicate and well balanced expression with lovely Islay flavours. It's the freshness and lovely fruitiness which makes this dram an attractive and pleasantly savoury experience with the maritime edge as an ideal counterpart. This, however, is all gone by adding water. Thus, I highly recommend to enjoy this young beauty neat. I thank Whisky-Doris (Versandhandel Doris Debbeler) for sample and photograph! Nose: Quite sweet on the nose with barley sugar, cereals and subtle peach. Clean phenolics with good intensity, fragrant peat, light smoke and a hint of tar. With time, subtle notes of cherry and plums arrive, lovely mixed with a hint of cinnamon and spiced oak in the back. Palate: Oh yes, this is strong and very intense on the palate. Deceptive fruitiness of plums and dark cherries at first, subtly soaked in sweet sherry, quickly overlaid with a massive and warming load of chilli, cloves, nutmeg, anise and oak. Once this warmness fades, dry notes of peat, medicinal flavours and a whiff of smoke linger nicely towards the finish. Finish: The finish is long, rich, and warm with a subtle sweetness of barley sugar. Phenolic with dry sherry notes, lovely mixed with spiced oak, cloves, tender cinnamon and crisp peat on the tail. With water: Carbolic, phenols, tar and peat. There's no chance for the lovely sweetness and fragrant fruitiness to shine through when water is added! The same on the palate. Phenols, medicinal flavours and tar are dominating here. Sherry derived flavours are significantly decreased in addition to a slightly restrained spiciness. The finish is medium long, slightly warm and very dry with oak, peaty flavours, medicinal notes, phenols and a touch of smoke. 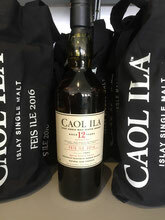 Comments: A fabulous cask strength release from Caol Ila with an attractive character. What you nose is what you get. 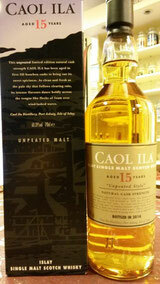 A typical and beautiful balanced version of Caol Ila with some lovely added fruitiness from the sherry cask. The sherry character isn't overwhelming but supports the distillery character in a perfect manner. For me, a sensuous dram, highly enjoyable when neat. Nose: Gently sweet aromas of peat smoke and bacon on the nose, lovely mixed with anise and a touch of green banana. Hints of oak and delicate citric fruit linger in the back. Very nice and attractive. Palate: Deliciously sweet on the palate with vanilla, star anise and subtle peach, complemented by a warming spiciness of oak, cloves and white pepper. 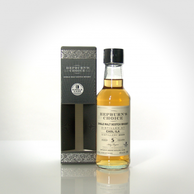 Tender peat smoke, a touch of tobacco leaves and lingering malted barley towards the finish. Finish: The finish is medium long, rich, and creamy with anis, vanilla, slightly spiced oak and gentle warming peat smoke on the tail. With water: There's less smoke on the nose with a few drops of water. Besides a slightly increased malty sweetness, medicinal notes, peat and bandage come to the fore. Plenty of anis on the palate with peat and smoke, while the delicate sweetness is significantly tamed. The finish is medium long and creamy with anis and cold peat smoke on the tail. Comments: A charming nose which is fully delivered on the palate. A beautifully balanced, rounded, example of this distinctive Islay malt with a lively citrussy and aniseed footprint. A middleweight dram, soft and delicate. I like it. Nose: Clean and fresh on the nose with delicate vanilla, toffee notes and ginger bread. Dried fruit arrive - mirabelle, ripe gooseberry and apricot, mixed with barley sugar sweetness. Round with a hint of mint and sea air, without any peat. Very nice indeed. Palate: Creamy, sweet and lively. Gentle vanilla fudge, complemented by a massive hit of spices - oak, nutmeg and pepper. Delicate fruity flavour with apricot jam, white peach and citrus notes emerge, leading to a smooth and lingering creamy finish. Finish: A pleasantly warming and rich finish with medium lengh. Sweet barley sugar and fruity notes mingle with slightly bitter orange peel towards the creamy end. Nicely mouth-coating. With water: The fruitiness almost jumps out of the glass. Peaches, apricots, gooseberries and apples, alongside delicate vanilla fudge and toffee. Significantly sweeter on the palate with strong fruity flavours, mixed with warm spices and prickling oak. The finish is warm, creamy and sweet with sticky apricot jam on the tongue. Amazingly delicate. Comments: Wow - this is quite an impressive unpeated Caol Ila. Rich, elegant and very palatable for a whisky at this high strength. A complex and well balanced Highland style dram. 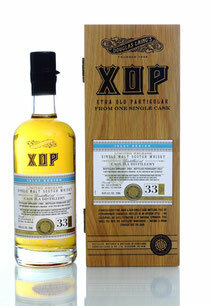 An interesting alternative to its peated brothers. I like it! I thank the Scottsman Harry Hammelmann for sample and photograph! Nose: Gently sweet aromas on the nose with crisp barley, complemented by a bold amount of peat, medicinal flavours, and subtle smoke. A hint of citrus notes emerges with a touch of strawberry in the back. Roasted almonds linger with sooty notes in the back. Very nice and aromatic. Palate: Deliciously sweet with red fruit and massive warm spices - cinnamon, oak, nutmeg and allspice. Malted barley and subtle strawberry arrive which are then given a blanket of peat smoke and earthy notes. Finish: An intense and rich finish with medium lengh. Sweet barley sugar and strawberry notes linger towards the hot and smoky end. Extremely mouth-coating. With water: Clean and fresh on the nose. Water tames a bit of the peatiness with more citrus fruit, oranges and strawberries coming to the fore. Prickling oak spice, nutmeg, cinnamon and juniper dominate on the palate with gentle sweet fruit and malted barley. The finish is medium long, sweet and quite smoky. Comments: Wow - this is quite an impressive young Caol Ila. The quarter cask did a very good job releasing a beautiful rose colour. It adds some nice red fruit aromas to the maritime and smoky character of this dram. The finish is incredibly satisfying. A superb and already nicely matured whisky, but better without water. I thank the German importer Prowhisky for sample and photograph!